Finding fish is the key to saltwater fishing success in Texas. We’re going to break this important topic into these categories: Where to Fish, Seasonal Patterns, On The Water Clues, and Trip Planning. The common theme for all of these strategies is a combination of basic knowledge of the fish, weather, and resource, and then an attitude and mindset when you get on the water. We're going to cover the basic knowledge here and you'll need to provide the mindset and attitude. The best way to describe this mindset and attitude is that of a hunter. Hunters know that they have to be very alert, using their senses of hearing, sight, touch, and smell to help them locate their prey. The other tactic they employ is stealth, being as quiet as possible and giving them the best chance for success. These will serve you well when finding fish, and increase your chances of saltwater fishing success. Here is the first question, right? Before you think about finding fish you have to go somewhere. We are blessed with a vast array of inshore waters along the Texas Gulf Coast. There are literally hundreds of spots to fish. Some common sense advice is in order here, along with a reliable reference of these spots. Follow the link to learn about both on the Where to Fish page. 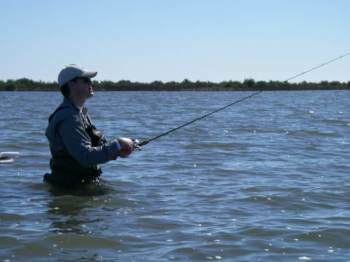 Predictable weather, tides, baitfish and gamefish migrations occur during the seasons we have along the Texas coast. Knowing these patterns is an excellent starting point to knowing how to find fish. Follow the links to learn more. Fall Fishing – Working the birds and the baitfish and shrimp migrations make Fall an exciting time to be on the water! Spring Fishing – Back to the shallows they go from the winter slumber. The fish are becoming more active. Learn how to fish the reefs and deal with the wind. Summer Fishing – Dawn Patrol is the ticket when the wind and water is right in the surf. Fast and furious action is available to early risers. Deeper shell is the ticket when it heats up. On The Water Clues – Learn the basics of the most important things to look for to find fish, including baitfish activity, slicks, and birds. Staying alert while you're fishing will increase your chances of success. This is where you put that "Hunter Mentality" into practice we talked about above. Planning Trips – My wife tells me that my mind leaves to go fishing a day and a half before the actual trip. For saltwater fishing success in Texas, knowing the Tides, Weather, and How the Fishing has Been are Key. Head to the Saltwater Fishing Tips page to learn more about Planning Trips. We hope you've learned something to help you find fish along the Texas Gulf Coast. Return from Finding Fish to the SFT home page.